Our Star Sale sticker design template will help you spotlight your special sales event. Star Sale is available in four different color schemes to accentuate your brand, two shapes, and three unique edge finishes. 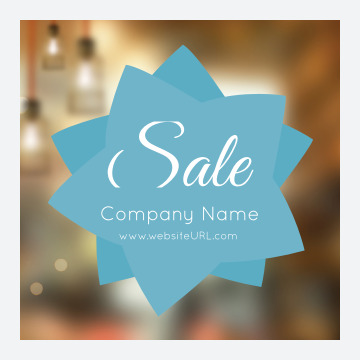 Star Sale features an appealing, toned down background image that suggests lights with a double star design in the foreground, which boasts the word “Sale” in elegant script along with space for your company name and website URL. This sticker design is ideal for holiday sales, department store sales, or home goods store sales. Personalize your sticker design with our online sticker maker today! Star Sale was created by a professional graphic designer and can be customized to match your brand with our online sticker design tool. Simply choose your template and color scheme, then follow the on-screen prompts to personalize your company name and website URL – or replace them with any text information or message you want. It’s fast, easy, and free! And, if you want to share your custom sticker design before printing, you can download a free PDF for team members and get valuable feedback! Stickers are powerful marketing tools because they make it easy to reach customers anywhere they are. PsPrint’s premium paper stock, vivid inks, and high-quality printing bring your custom sticker to life. We’re so confident that you’ll love your stickers that we offer a 100% customer satisfaction guarantee. Do you want your stickers to stand out with special shine? We offer foil stamping services! Do you like the convenience of sheet stickers? We have them! Do you want to display your sales advertising in your store windows? We carry window clings! Do you want to create something really special and unique but need help? Our friendly custom printing experts are available to help your reach your vision. Partnering with PsPrint for all your sticker printing needs is a smart business decision! And don’t forget we offer a full line of other print marketing products, too!